As teachers and students resume their school year routines, PBS LearningMedia, the media-on-demand service designed for K-12 classrooms, has announced a new app for students. For the first time, users can now access learning resources on tablets through the official PBS Student app, available for free for iPad. This app complements the PBS LearningMedia Student portal, launched earlier this year that is designed to create a safe and trusted destination for students looking for content to help with homework or learn something new. PBS LearningMedia is also launching numerous innovative features enabling more opportunities for teachers to find, share and use digital content. The PBS Student app is the ideal platform to watch and learn with videos, games and images from PBS and PBS KIDS content including resources from NOVA, DANIEL TIGER’S NEIGHBORHOOD and the Ken Burns collection anytime, anywhere. Designed specifically for students in grades K-12, the app provides access to thousands of resources covering all subject areas, from math and science to English and social studies. Puzzle Builder: Create an interactive word search or crossword puzzle that can be printed or assigned to students as an online activity. Students can complete the puzzle on a desktop or touch-screen (mobile) device. Quiz Maker: Develop an online quiz using any of the five options available: short answer, essay, multiple choice, fill in the blank or true/false. Educators can use this feature to drop into a lesson builderor to track student progress. Lesson Builder: Combine digital resources from PBS LearningMedia with users’ own content to build digital lessons. Users can add a quiz from the Quiz Maker tool and assign to students. Teachers Build and Share Content: Educators can now use these productivity tools to build their own digital content and share it with other educators. 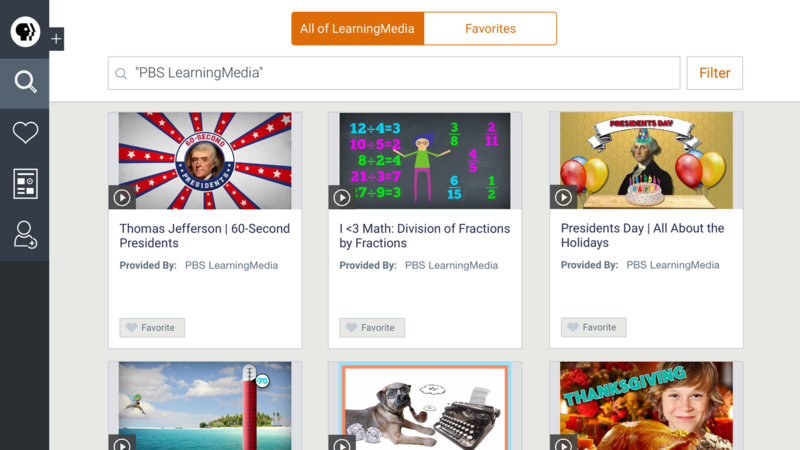 “Quick Assign”: More easily assign or share any resource in the PBS LearningMedia Library. A unique Assignment Code will be generated for teachers to share immediately with students. See what is happening: Explore the new curriculum calendar and events guide to find resources and access free professional development events and trainings. To support educators with integration of digital technology and media in the classroom, PBS LearningMedia on October 19 will launch the 3rd annual Get Your Tech On program, a national initiative that educates teachers about how to maximize digital content and technology usage in the classroom. Get Your Tech On will highlight technology-themed resources and tools, provide prizing opportunities for participating teachers and inspire digitally savvy teachers to apply for the upcoming PBS Digital Innovators program. This year’s Digital Innovator program application process will open in December. PBS LearningMedia will continue to release additional content and resources for teachers and students throughout the school year. To sign up for a free account and begin accessing the more than 100,000 digital resources aligned to national and Common Core State Standards, visit pbslearningmedia.org. PBS Kids Releases Music Album, "PBS Kids Rocks!"